It was the sovereign of the Eastern forest, a species so massive and widespread that no one could likely have imagined the landscape without it. In the end though, all it took to wipe out the American chestnut was the humblest of pests, a microscopic fungus introduced from Asia. When the chestnut blight swept through the region in the first decades of the 20th century, an estimated four billion trees were left dead from Georgia to Maine. Yet even in the wake of the blight there were survivors, trees haunting the margins of the American chestnut’s range, flowering and bearing fruit with indifference to their neighbors’ demise. When plans for the species’ revival were laid in the 1980s, scientists with the nonprofit American Chestnut Foundation saw these hangers-on as a vital tool. On Virginia test farms, pollen from native trees was crossed with the blight-resistant Chinese chestnut. 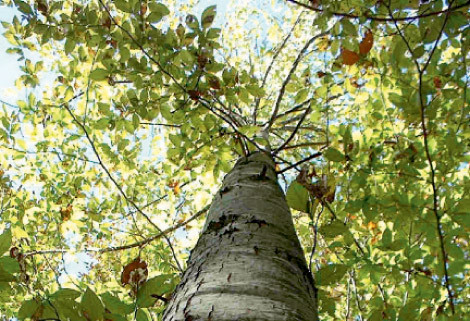 Through a technique called backcrossing, those first-generation hybrids were then bred back with American trees, thus diluting the foreign genes and bringing the native ones to the fore. The result, all these years later, is a tree that embodies the Chinese chestnut’s blight-fighting capabilities, but has the appearance of an American chestnut. “It’s 94-percent American chestnut,” explains Meghan Jordan, the foundation’s spokesperson. Now headquartered in Asheville, the nonprofit group last year oversaw the planting of hundreds of the blight-resistant seedlings on national forest land in Tennessee, Virginia, and North Carolina. Initial reports have been encouraging. “Many of them are already flowering, which tells us that their vigor is excellent,” she says. For the first time, these American chestnuts are being offered to the public. With a donation of $300, sponsors will receive a membership to the American Chestnut Foundation and a pair of the seeds to plant. Participants will be asked to monitor their trees’ progress and report back to the foundation, acting as citizen-scientists in the rebirth of this once-grand species.